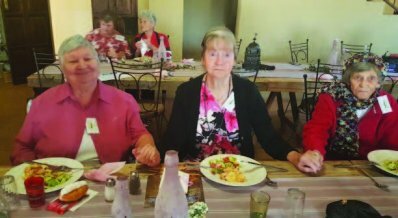 Tierpoort Seniors were welcomed with spring blossoms by hostess Charmaine Lourens of Shokran on 5 September. The highlight of the morning was a gesture from two local grade seven learners, Kristen Boshoff and Douline Pretorius, from Laerskool Constantiapark. 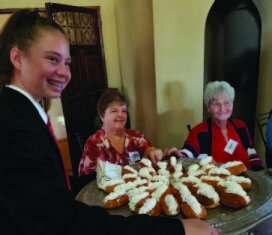 They decided to treat the Seniors with creamy éclairs, for a Life Orientation school project. 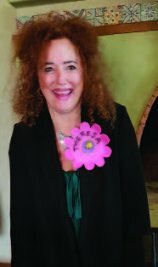 Committee member Theresa Joubert planned, and enthusiastically presented “His Master’s Voice”. The guests listened to opera music, guessing who the singer was and out of which opera. The menu, prepared and presented by the committee, consisted of a choice of vegetarian or bacon-filled macaroni and cheese. This was accompanied by a salad, the ingredients donated by Willie van Rooyen and his team from OK foods, Tierpoort. Hostess Charmaine prepared a Crème Brûlée for desert. Next month’s outing will be to Ludwig’s Roses.